….advocates say the simple act of registering and voting brings a sense of dignity to those living on the streets. "I came across two old timers - one was 60, the other was 80," says Michael Stoops, director of community organizing at the National Coalition for the Homeless in Washington, of his first attempt to register voters in 1980. "The younger man had not voted since he had voted for John F. Kennedy, and the old-old-timer hadn't voted since he had voted for Franklin Roosevelt. Those folks were so excited that someone wanted them to get involved in the system." The experience convinced Mr. Stoops that registering large numbers of homeless voters was not only possible, but it could also have a tangible political impact. In 1992, he started the "You Don't Need a Home to Vote" campaign, and has since registered tens of thousands of homeless voters using shelters, post-office boxes, and friends or families' residences as their permanent address. This year the coalition is working to register voters in six target cities including Nashville, Tenn.; Little Rock, Ark. ; and Cleveland, Ohio. 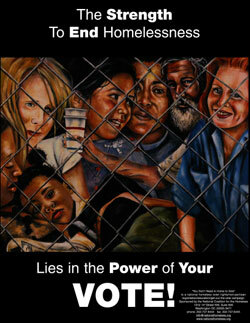 It aims to reach out to homeless in all 50 states during National Homeless Voter Registration Week in late September. I served on the NCH board for several years and took part in voter registration campaigns from 1988-2000. Oregon is one of the few states with a homeless rights voting law. However, vote-by-mail has made it nearly impossible to register those who are homeless to vote. Without a permanent mailing address it is difficult for people to receive their ballots.